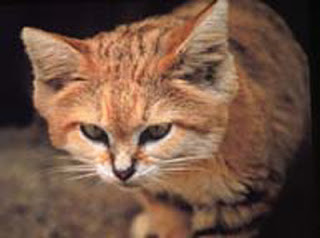 The Sand Cat (Felis margarita) is a small wild cat distributed over African and Asian deserts. 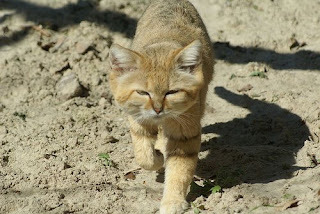 The name "desert cat" is reserved for a subspecies of the true wildcat, but it would be appropriate for this species. 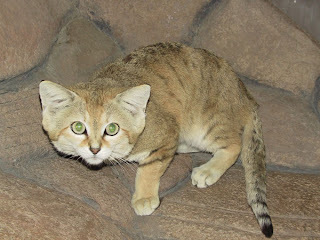 It lives in those arid areas that are too hot and dry even for the desert cat: the Sahara, the Arabian Desert, and the deserts of Iran and Pakistan. It lives for about 13 years in captivity. The length averages almost 50 cm (20 in), plus a 30 cm (12 in) tail, and the weight averages at about 2.7 kg (6 lbs). The head is conspicuously broad; the ears are large and pointed. The colour of the fur is a sandy yellow, with pallid bars, which are sometimes hardly visible. Generally the bars are more visible in the African subspecies. The mucosa of eyelids is a striking black. The fur on the tip of the tail is black. The paws are covered with long hairs which protect the skin against hot sand. 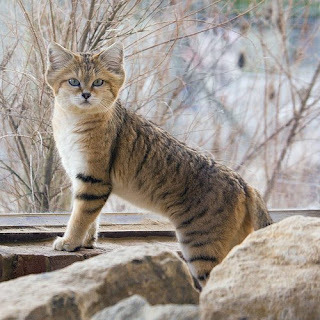 The sand cat can survive in temperatures ranging from −5 °C (23 °F) to 52 °C (126 °F). In the daytime the sand cat hides under rocks. At night it hunts for rodents, lizards and insects. 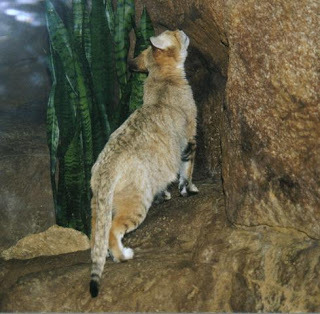 Since the Sand Cat obtains all the water it needs from eating its prey, it mostly stays far away from watering points. Sand cats congregate only for mating so numbering them is a difficult task. It seems however that its numbers have been declining in the Arabian desert following a rarefaction of its prey. In 2007, the first four kittens born in captivity are being raised at the Al Ain Zoo in the United Arab Emirates as an effort to preserve the local fauna. F. m. thinobia is sometimes regarded as a separate species; F. m. scheffeli is listed by CITES as endagered, although IUCN only lists it as 'near threatened' as of 2001.